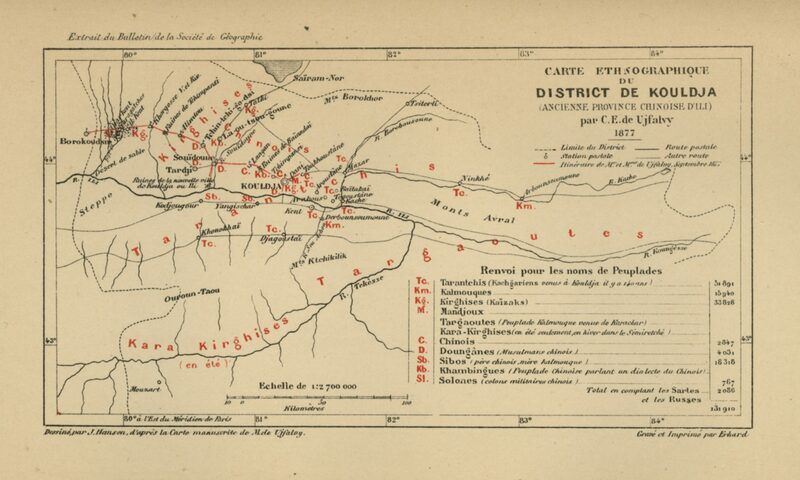 In 1877, the French Government sent Charles Eugène de Ujfalvy de Mezö-Kovesd to Russia, Siberia and Turkestan, with the task of conducting archeological, anthropological, ethnographic and philological research. 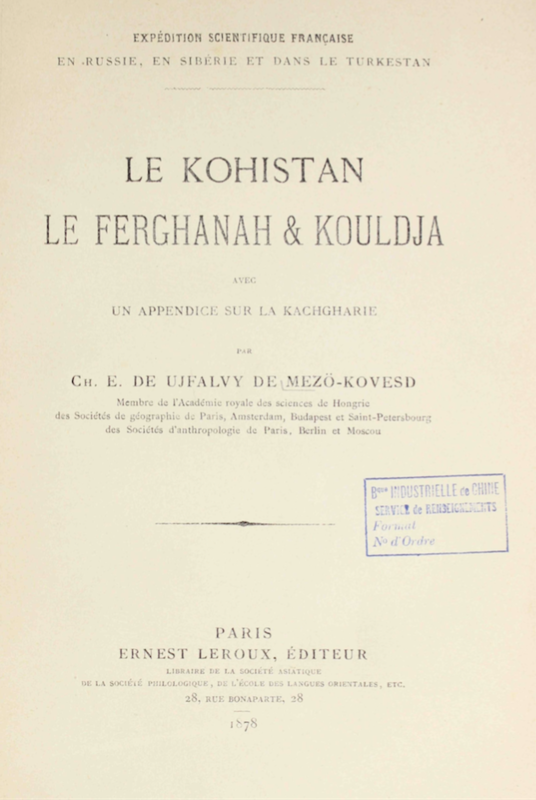 After having returned from his field trips Ujfalvy de Mezö-Kovesd wrote this travel account about Kohistan, Fergana and Kulja (alt. spellings Gulja, Ghulja, Qulja, and also known as Yining). Ujfalvy de Mezö-Kovesd writes about the regions he has experienced with a special focus on anthropological and ethnographic data. He gives detailed descriptions of people – their physical appearances and ethnic origins as well as society and family structures, habits, traditions, religion, and commerce – from Kohistan, the higher valleys of Zarafshan to Fergana, the former Khanate of Kokand and Kulja, a part of western China. 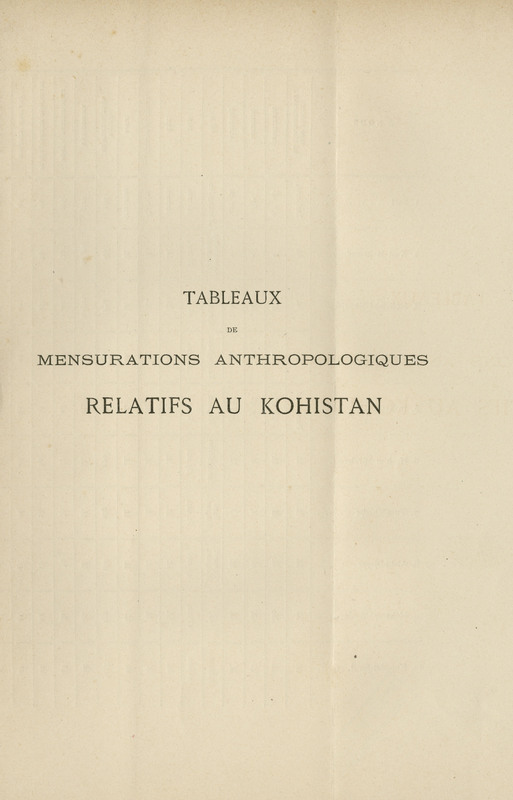 Attached as foldable appendices at the end of the book are some twenty tables with ethnographic and anthropological data together with four maps rendering a visual representation of the different ethnicities of Kohistan, Fergana, Kulja and Central Asia in general. The anthropological data given in the tables offer details about people’s settlements, religion, occupation, age and gender, while the ethnographical data are concerned with such aspects as physical appearance and measurements of face and body parts. The first chapter (pp. 3-36) is about Kohistan, a region between the Zarafshan River and Panjikent. In Panjikent, the capital of Kohistan, Ujfalvy de Mezö-Kovesd is greeted by General Kauffmann, the General Governor of Turkestan (a pencil sketch of whom is available on p.VIII ). The General Governor promises him full access to the areas he wishes to investigate. In order to conduct anthropological measurements Ujfalvy de Mezö-Kovesd gains the confidence of the locals by pretending that he is a doctor from the West. 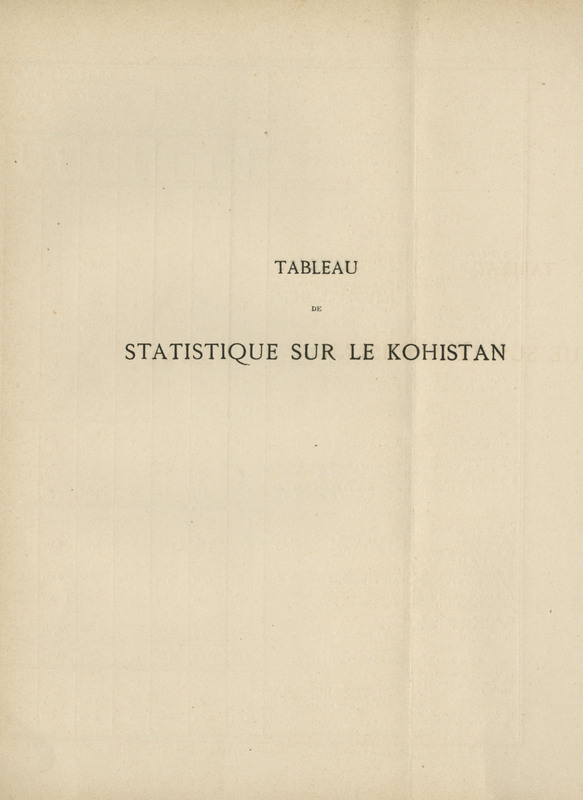 Besides body measurements, presented from a detached and scientific point of view, the reader is presented with many personal judgments about people in Central Asia, such as: “L’indolence est le caractère prédominant de tous les Musulmans de l’Asie centrale” (p. 13). 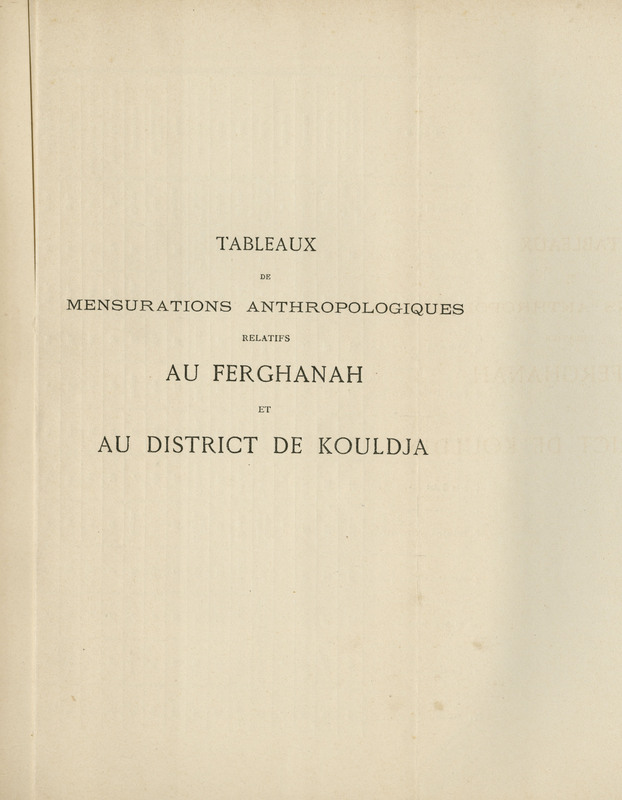 The chapter ends with an ethnographic map of Kohistan on page 36, followed by tables of anthropological data. The second chapter (pp. 39-112) is about the Russian province of Fergana. The Syr-Darya River runs through Fergana, which is surrounded on three sides by mountains. There are three fertile areas in Fergana, separated by three sterile areas of rocks. The author notes the three most common ethnic groups inhabiting each of the three different areas – Uzbeks, Tajiks, and Kara-Kirgiz, respectively. Along the Syr-Darya there are also Kazak-Kirgiz, Kara-Kalpaks, “Turks” (Tourks/Tourouks), among others. The administration of Fergana is divided into 7 districts: Kokand; Marghelan; Wadil; Osch; Andijan; Namangan; and Touss. Ujfalvy de Mezö-Kovesd calls Kokand the most beautiful and modern city in the whole of Central Asia. According to Ujfalvy de Mezö-Kovesd, there are 13 different population groups in Fergana, the appearance and descent of which he describes in detail. As the biggest population of Fergana, he refers to the so-called Sarts. He writes that, in Turkestan, all settled people and city people, except for the Tajiks, are called Sarts. The meaning of this name is said to be ‘mixed origin’ and he rejects the interpretation Sary it (yellow dog), an expression stated to be used by the nomads for settled people. The second biggest group in Fergana are the Uzbeks, who are characterized as half-nomads, since they have houses and yards but prefer to live in tents on the yard, keeping supplies in the house. Other peoples living in Fergana are the Kara-Kalpaks, an Uzbek tribe; the “Turks” (Tourks/Tourouks), a mix of Uzbeks and Kara-Kirgiz; Kashgarians, a mix of Uzbeks and other Turkic or Tatarian tribes; the Kara-Kirgiz; the Kirgiz-Kazaks; the Tajiks, who are of Persian descent; the Bohemians (the author mentions their “brothers in Europe” and may be referring to Romani people here); as well as “Hebrews” (Hébreux), Afghans, Persians, Hindus, Tatars, and Russians. 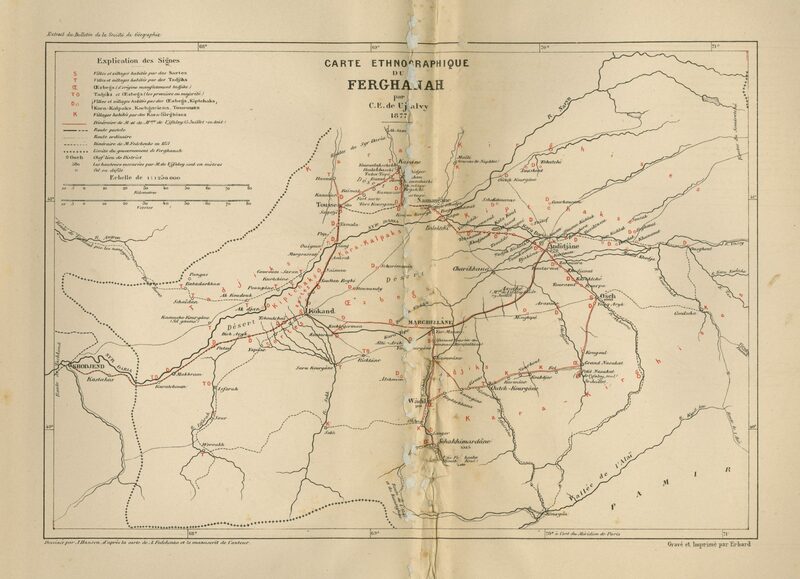 The expedition leaves Tashkent in June 1877 and travels to Kokand, Marghelan, Wadil, Shah-i-Mardan, Andijan and Osh. In the meantime they learn that Yakub Beg, the Amir of Kashgaria, has died suddenly and mysteriously, and that he will be buried in the largest temple in Kashgaria, that of Apak-Khoja. At Osh they make an excursion to the mountain of Takht-i-Sulayman, described on pp. 97-99 by the traveling companion M. Müller. According to the legend, King Solomon came to a small village in this mountain and asked the people what they wanted the most and when they said that they wanted water, he commanded the mountains to open up, as a result of which a lake was created with water from the river “Ak-Bora”. The third chapter (pp.115-135) is about Kulja, which is the old Chinese province of Ili. This chapter starts with a historical account of the Dzungaria region, which was once occupied by the Kalmyk, a Mongolian people. In 1678, after many battles with China, the Kalmyk gained control over Turkestan and Tibet, including all of Kashgaria, until the 18th century when China reconquered Dzungaria and Turkestan. In 1758 there was a massacre of one million Kalmyks by Chinese soldiers. The Chinese built the city of Kulja, and there they placed recruited soldiers from Mongol tribes as well as criminals and wanderers (p.117) without land in China, as well as Dungans, i.e. Chinese Muslims, and Taranchis from Turkestan. In 1771 a large group of Kalmyks who had previously fled to Russia, returned to the area. At the end of the book, there is an additional chapter called Appendix (pp. 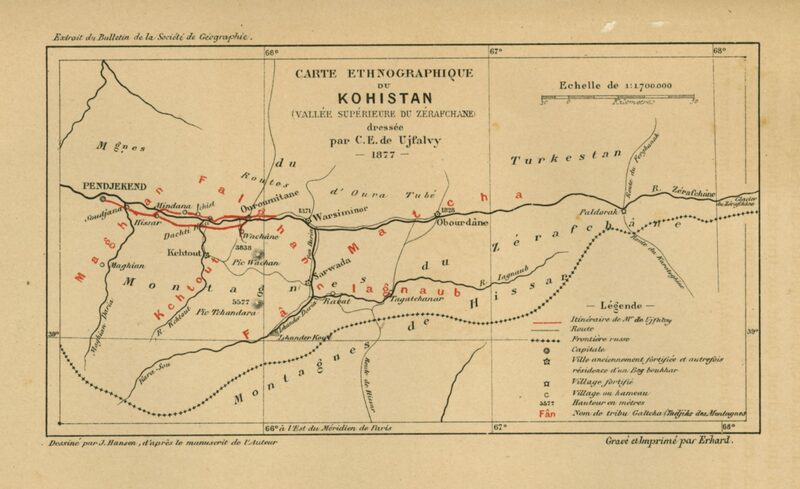 149-177), where Ujfalvy de Mezö-Kovesd has gathered geographical, historical, and anthropological information about Chinese Turkestan from different sources, one of which is a report by the Russian officer, Lieutenant-Colonel Kuropatkin, who had recently come back from an expedition to Kashgaria. The book ends with a supplementary note on p.181 about the latest political developments in Kashgaria after Yakub Begs death. Printed in 1878, this is the first volume in a series of three. The second volume is about the Syr-Darya Valley, Tashkent, Samarkand, Semirechie, and Siberia, and the third volume is about the land of the Bashkirs in the Ural Mountains, archaeological finds in Finland and Russia. This first volume is dedicated to the Grand Duke Konstantin Nikolayevich, president of the society of geography in St. Petersburg and second son of the Tsar Nicholas I of Russia. There is a blue stamp on the title page from Banque Industrielle de Chine, information service, no 80 / H97. Ujfalvy de Mezö-Kovesd was a member of the Royal Academy of Sciences of Hungary, as well as member of the societies of geography of Paris, Amsterdam, Budapest and St. Petersburg, and member of the societies of anthropology of Paris, Berlin and Moscow. Marie de Ujfalvy-Bourdon, the wife of Ujfalvy de Mezö-Kovesd who accompanied him during his travels, wrote her own account of their field trips. It was published in a journal called Le tour du monde, in 1879. A picture of the first page of her account is available here. An article about her account is available here.